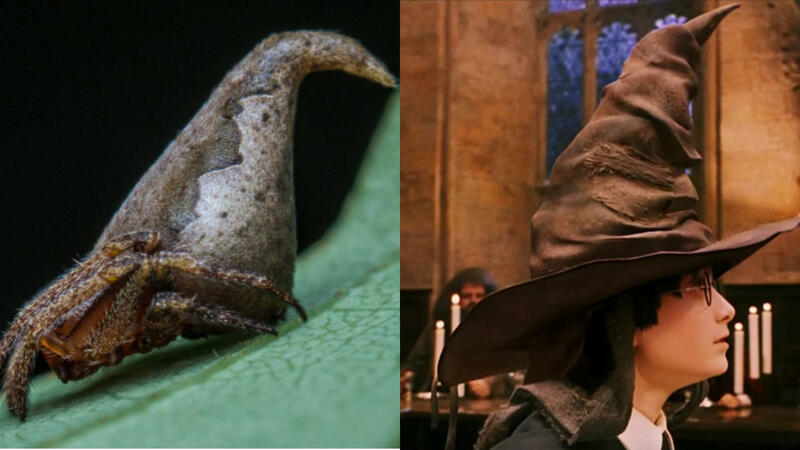 A new spider species has just been discovered, but it already has a doppelganger — the sorting hat from the “Harry Potter” series. Three scientists in India discovered the new spider species and named it after the enchanted hat after noticing the striking similarities. The species is called Eriovixia gryffindori, after the hat’s original owner, Godric Gryffindor. In the books, the sorting hat designates which house of the magical Hogwarts school each student will join. “This uniquely shaped spider derives its name from the fabulous, sentient magical artifact, the sorting hat, owned by the (fictitious) medieval wizard Godric Gryffindor, one of the four founders of Hogwarts School of Witchcraft and Wizardry, and stemming from the powerful imagination of Ms. J. K. Rowling,” the scientists wrote in their report for the Indian Journal of Arachnology. The researchers, Javed Ahmed, Rajashree Khalap, and Sumukha Javagal, found the spider in India’s Western Ghats region. Ahmed told BBC News they simply “bumped into” it the tiny creature, which measures just about 7mm in length (about a quarter of an inch), while searching the area. According to the report, it also hides in and mimics dried foliage to protect itself from predators. Ahmed tweeted about the impressive discovery, which was announced not long after the “Harry Potter” spin-off, “Fantastic Beasts and Where to Find Them” hit theaters. He wasn’t the only one excited about the news. Author J.K. Rowling congratulated the scientists, saying that she’s “honored” by the name.